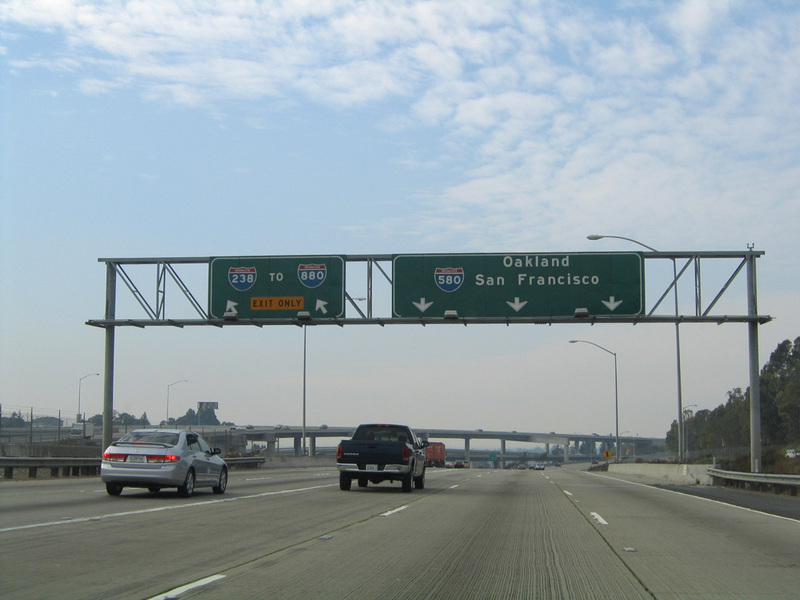 Interstate 238 is a short connector between I-880 and I-580 in the East Bay Area of San Francisco Bay. 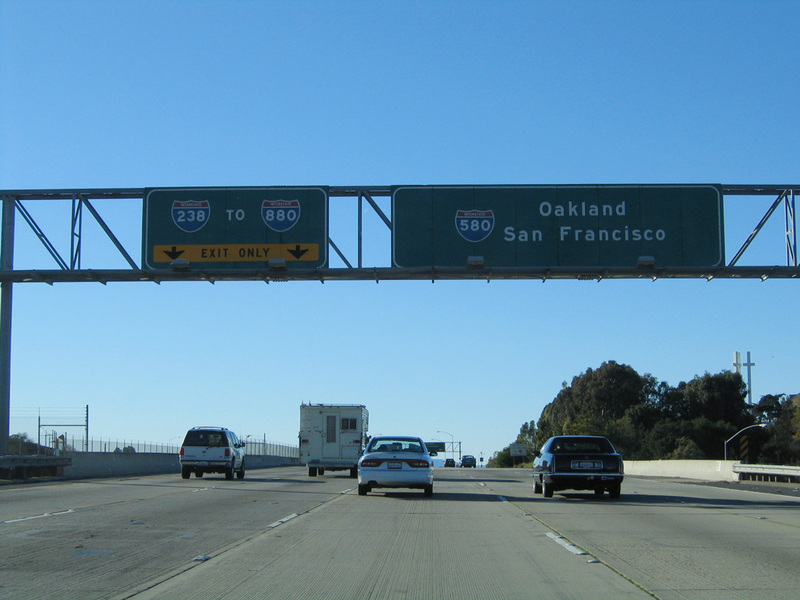 Signed as a north-south route in conjunction with California 238, the freeway portion travels east-west. 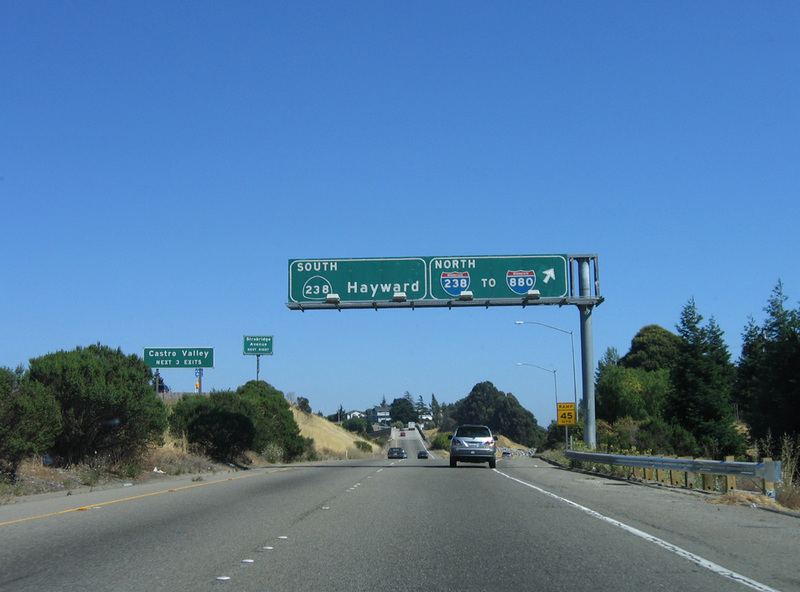 The cardinal directions allude to the original Mission Freeway plans, which called for SR 238 to continue southeast as a bypass of Hayward, then extend to Interstate 680 just southwest of the Sunol Grade. 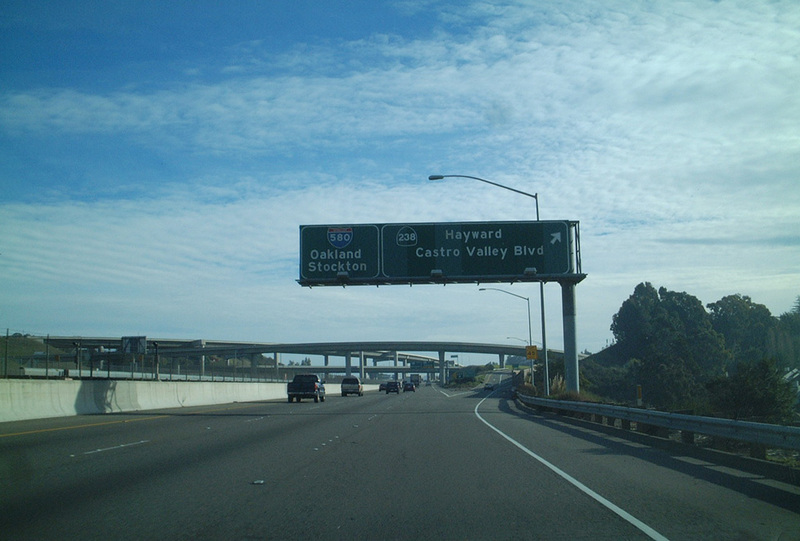 Interstate 238 provides part of a truck route between I-580 at Castro Valley and the San Francisco-Oakland Bay Bridge (Interstate 80) in conjunction with the Nimitz Freeway (Interstate 880) through Oakland. This is due to a weight restriction along Interstate 580 (MacArthur Freeway) south of Grand Avenue in Oakland. 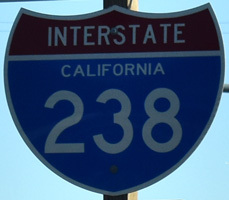 Unlike all other three-digit routes within the Interstate Highway System, I-238 has no parent route. 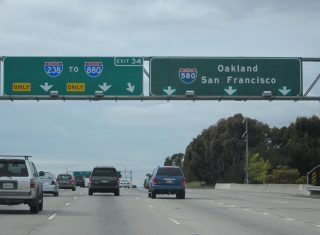 The numbering of Interstate 238 was due to the timing of its acceptance into the system; at that time, all “branch” routes of Interstate 80 (180 through 980) were reserved for other routes. Approved by the American Association of State Highway and Transportation Officials (AASHTO) on June 20, 1983, I-238 overlaid a preexisting stretch of State Route 238 between San Leandro and Hayward. 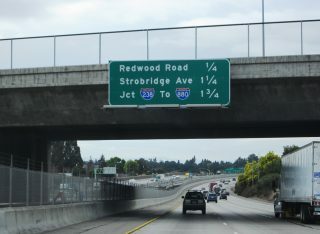 The same meeting included the renumbering of Interstate 180 across the Richmond-San Rafael Bridge as an extension of I-580. 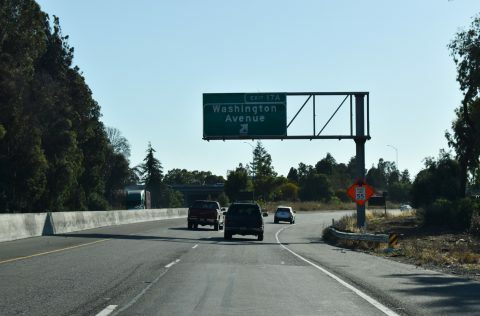 Renumbering SR 238 as I-180 however was not an option as California does not duplicate its state routes (SR 180 is assigned to a long east-west state route through Fresno). 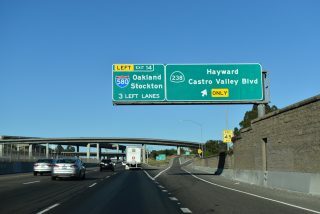 Interstate 238 was designated in 1984 as a result of California State Assembly Bill 2741, which modified the route numbering for SR 17 and Interstate 580 in the state highway system. 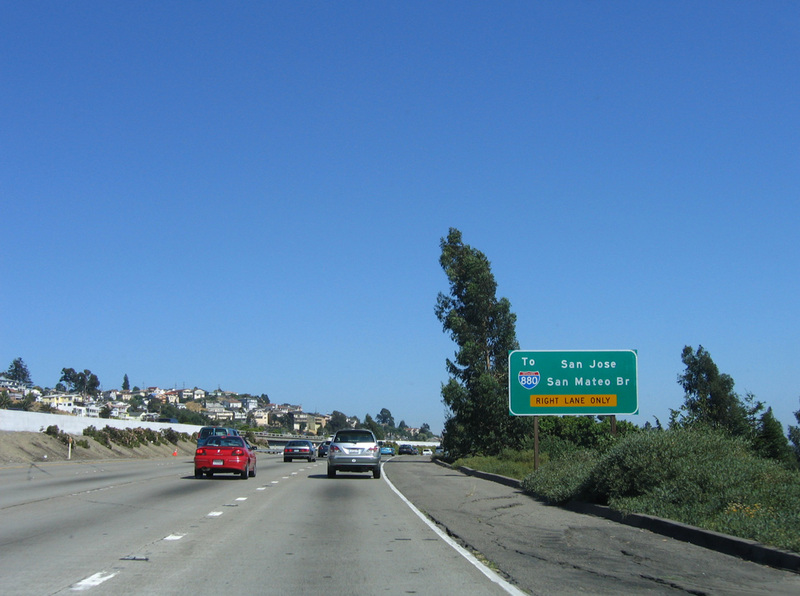 This legislation introduced I-238 and I-980 in Oakland, provided for an extension of I-580 to Marin County, and designated SR 17 as I-880 between San Jose and Oakland. 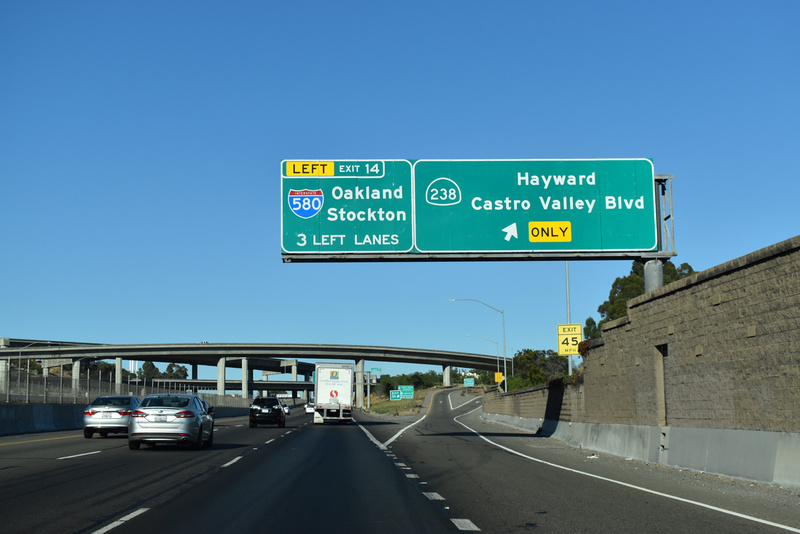 Sign changes due to AB 2741 were implemented along all affected routes by 1985. 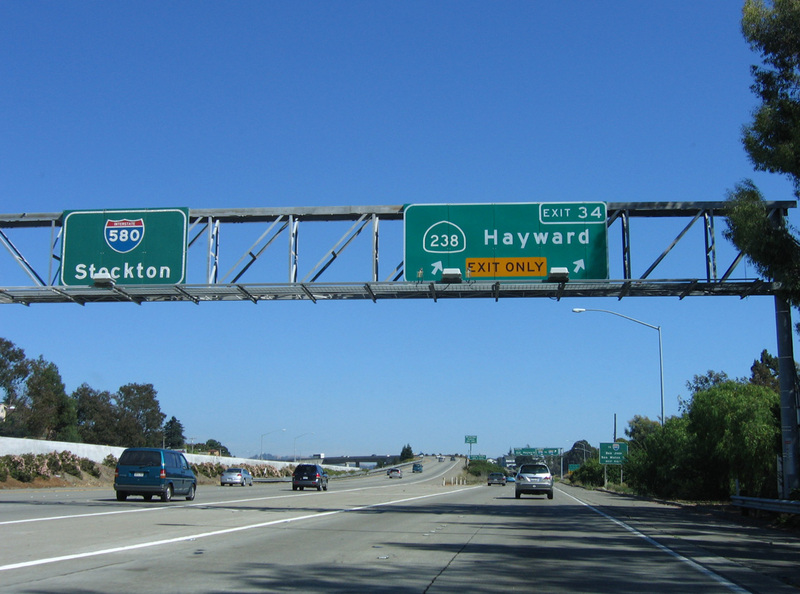 Originally California 238 was to continue as a freeway south from Interstate 580 through Hayward. Those plans were shelved indefinitely due to residential opposition and environmental concerns. A court decision in 2003 ended the plans for the recommended Mission Freeway along the green route, with subsequent plans calling instead for the upgrade of Mission Boulevard into an expressway, with potential interchanges at key locations. 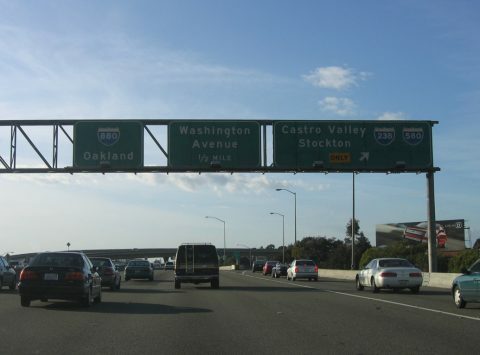 Stub ramps, since demolished, were previously located along I-680 west of Exit 15 (Washington Boulevard) for the unconstructed freeway. Sound walls separate Interstate 238 from residential areas west of the Mission Boulevard (SR 185) ramps. 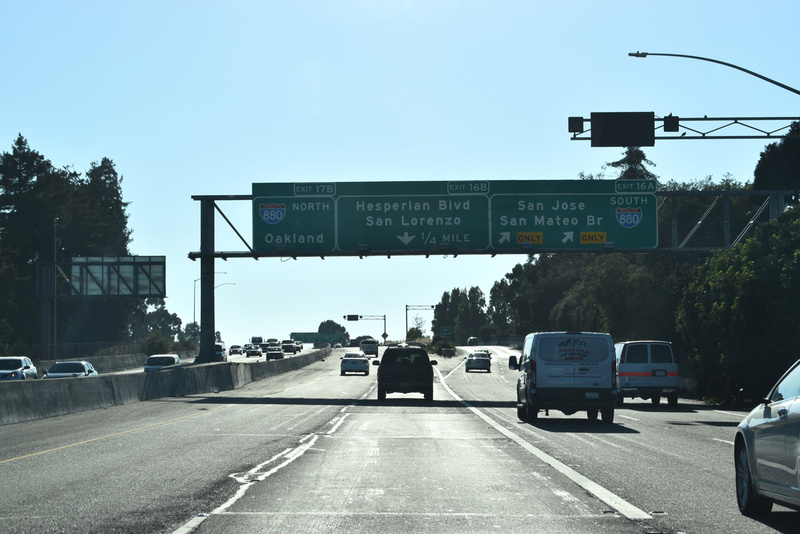 The freeway continues west 0.75 miles to the flyover (Exit 16A) for Interstate 880 south. Photo taken 07/11/18. Forthcoming Exit 16A for I-880 was expanded to two lanes by 2009. Photo taken 07/11/18. 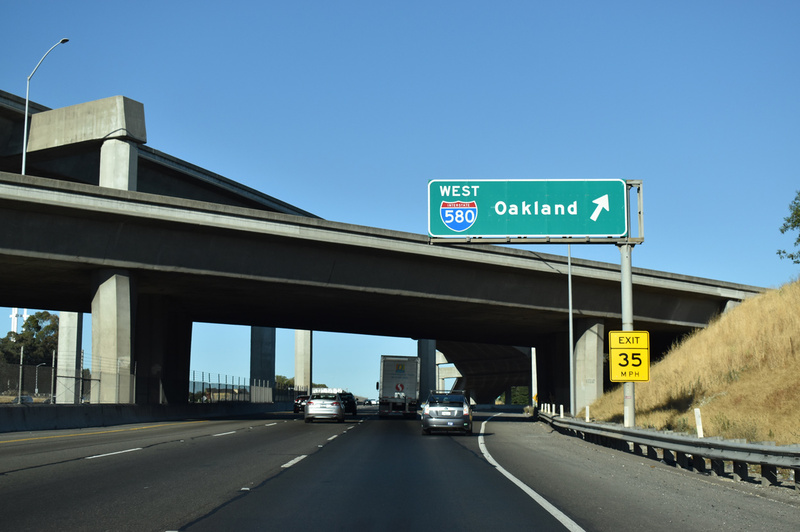 A high speed flyover (Exit 16A) shuttles motorists onto Interstate 880 (Nimitz Freeway) south as the remainder of I-238 north continues to I-880 north. Photo taken 07/11/18. 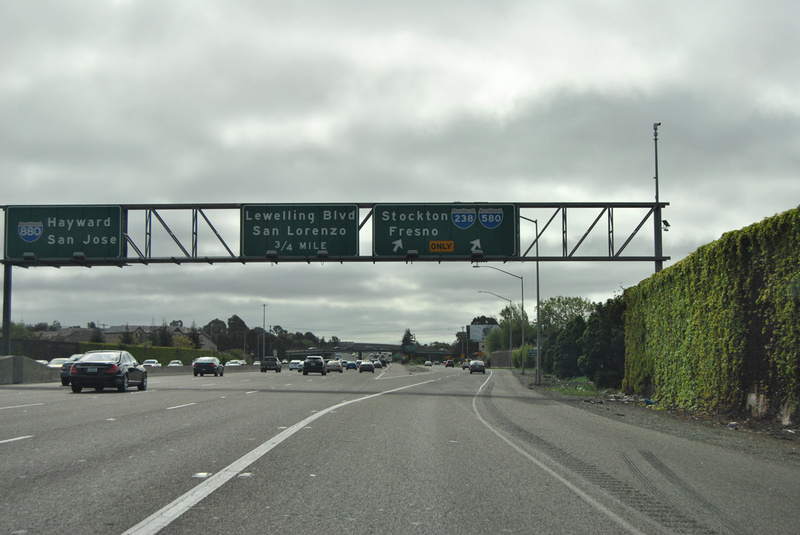 Two local exits depart from Interstate 238 north for San Lorenzo and south San Leandro prior to the merge with I-880 north. Photo taken 07/11/18. 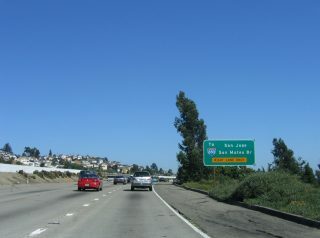 One mile south of the full-Y interchange (Exit 31A) with Interstate 238 south on I-880 north. Photo taken 03/18/06. 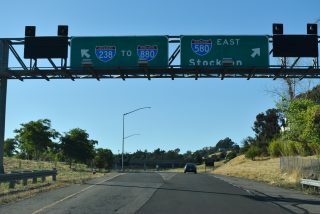 Exit 30 leaves I-880 (Nimitz Freeway) north for Hesperian Boulevard and San Lorenzo just ahead of the off-ramp for Interstate 238 south. I-238 references the I-580 south control points. Photo taken 03/18/06. 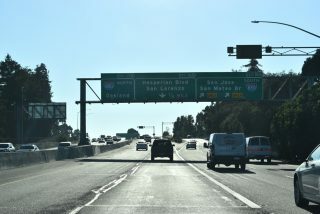 A two lane off-ramp (Exit 31) departs Interstate 880 (Nimitz Freeway) south in 0.4 miles for Interstate 238 south. I-238 provides a connection to I-580 south for Stockton and Fresno in the Central Valley. Photo taken 03/27/16. Exit 31 forms a collector distributor roadway through the parclo interchange with Washington Avenue. 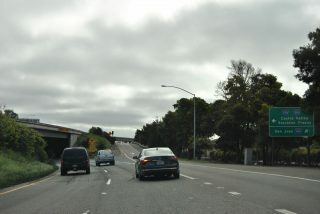 An unmarked ramp precedes the southbound ramp for I-238 from I-880 south. Photo taken 03/27/16. 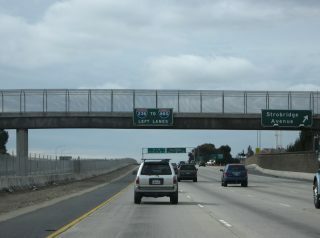 A loop ramp adds traffic from Washington Street and San Leandro as Interstate 238 south passes below the I-880 mainline. I-238 ventures east through Ashland to merge onto I-580 south through Castro Valley. Photo taken 03/27/16. The original four-lane freeway of I-238 west from Ashland Avenue to Washington Avenue. Photos taken 12/27/01. Interstate 238 south defaults onto Interstate 580 east beyond the southbound off-ramp to California 238 (Foothill Boulevard). 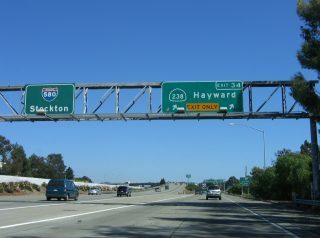 The cloverstack interchange between the two freeways includes wide grassy areas originally reserved for the freeway continuation south to Hayward. Photo taken 07/11/18. 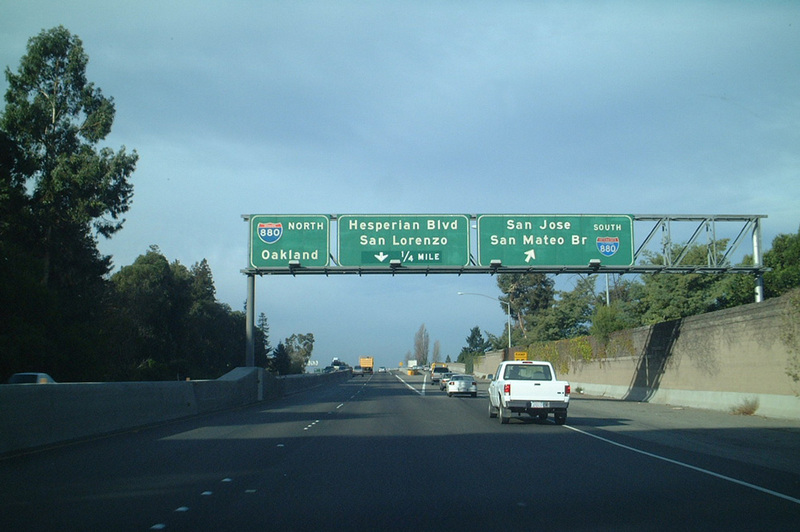 A loop ramp (Exit 14) follows for Interstate 580 leading northwest to Oakland. 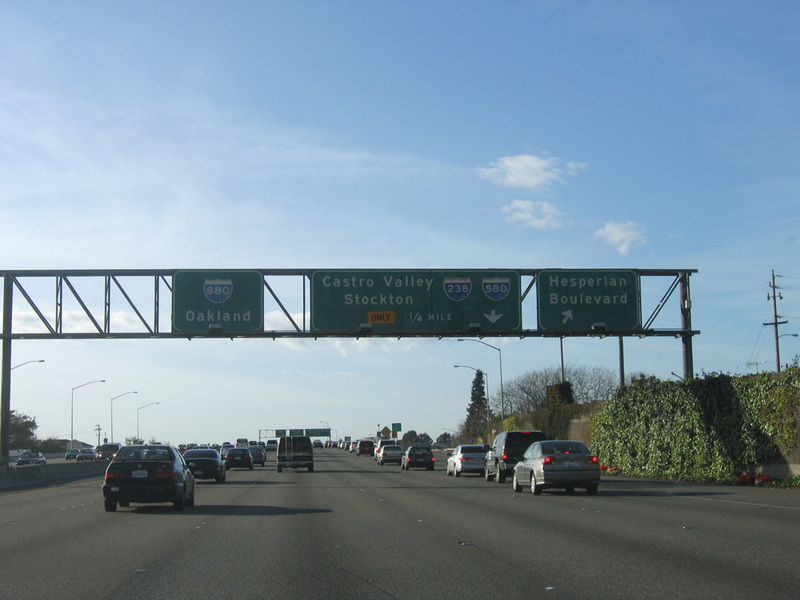 I-580 connects the San Francisco Bay area with the Central Valley at Tracy. Photo taken 07/11/18. 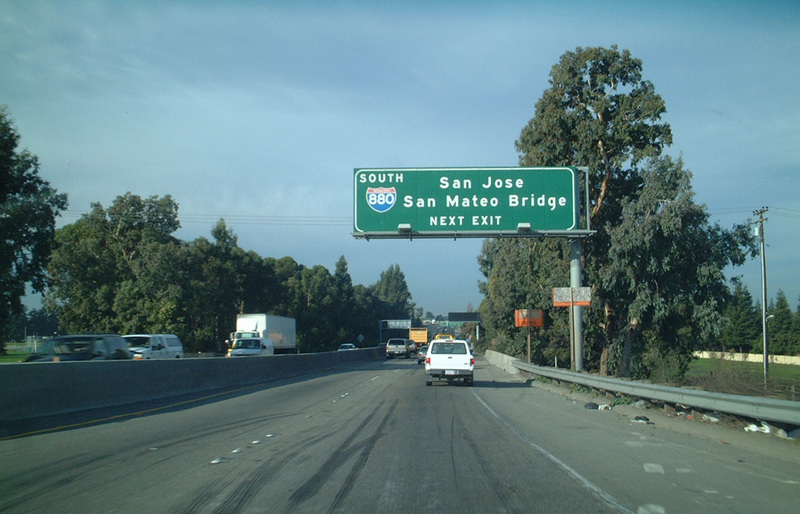 Interstate 238 ends as I-580 turns east through Castro Valley for the climb east to Dublin Canyon. Exit numbers along I-238 reference the mileage of SR 238 south to Interstate 680 at Fremont. Photo taken 07/11/18. 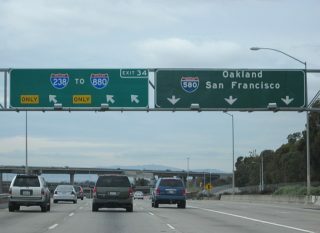 Interchange sequence sign displaying I-238 to I-880 on westbound Interstate 580. 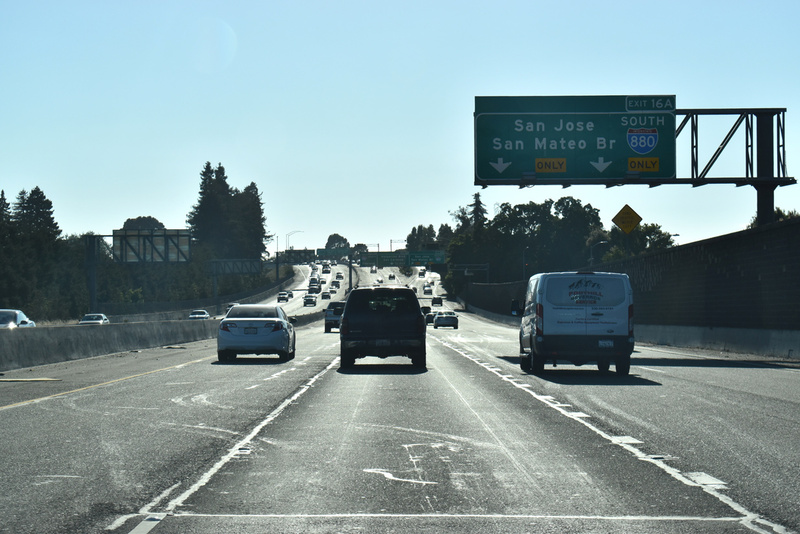 The left lanes of I-580 west default onto Interstate 238 north at Exit 34 in 1.75 miles. I-238 and I-880 provide an alternate route to I-580 for the San Francisco-Oakland Bay Bridge and Interstate 80. Photo taken 02/20/12. 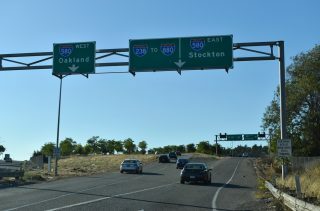 The forthcoming cloverstack interchange joins Interstates 580 and 238 with SR 238 (Foothill Boulevard) to the southeast. There is no access to SR 238 south from I-580 west however. 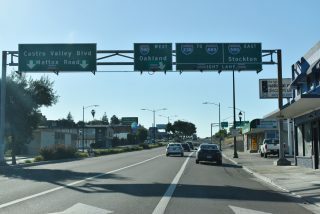 Strobridge Avenue (Exit 35) and Mattox Road instead provides a surface route to Foothill Boulevard south. Photo taken 02/20/12. Spanning Strobridge Avenue, westbound I-580 separates with three lanes continuing onto the MacArthur Freeway north to eastern Oakland. 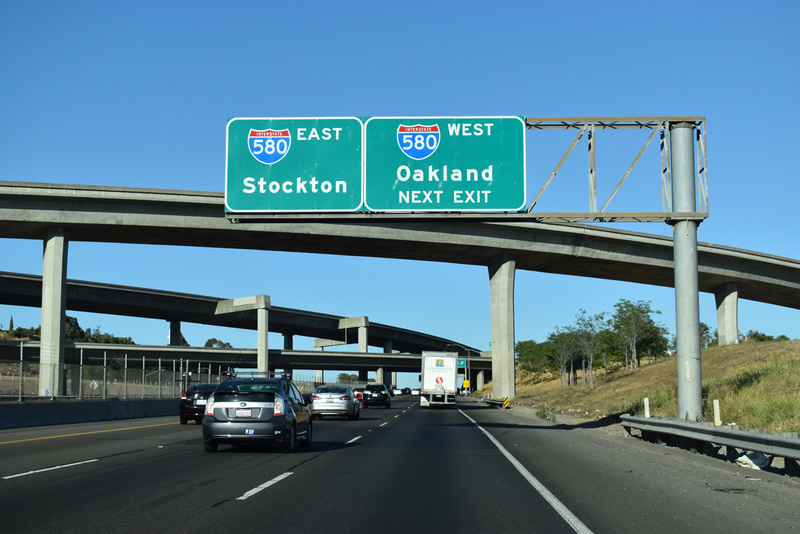 I-580 splits with SR 13 (Warren Freeway) in 8.5 miles. 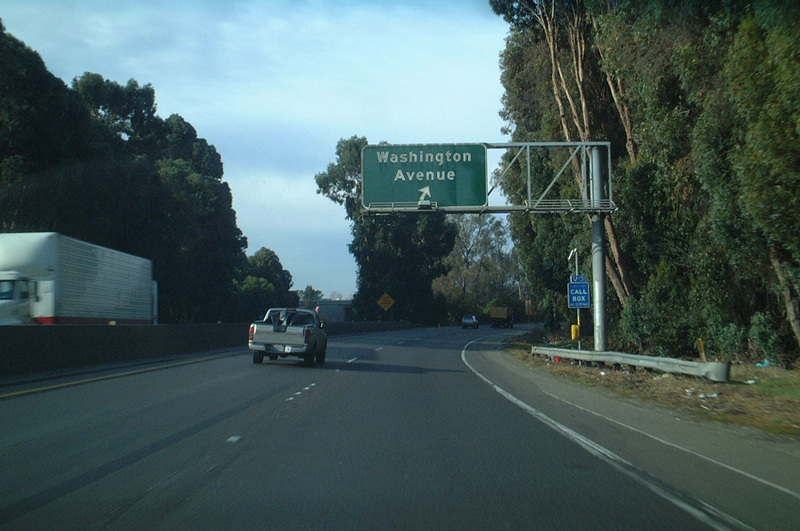 The Warren Freeway provides a cut off east to SR 24 (Grove Shafter Freeway) for the East Bay Cities of Walnut Creek and Concord. Photo taken 02/20/12. 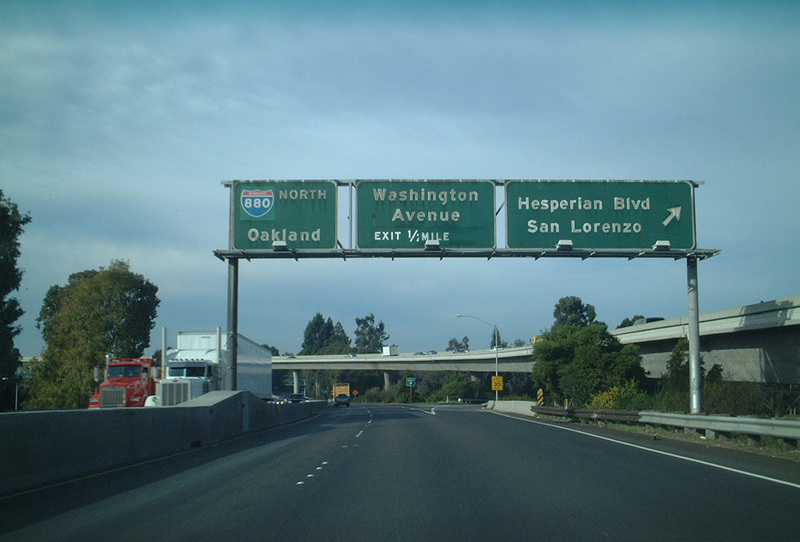 Left Exit 34 departs for Interstate 238 north to Ashland, San Lorenzo and San Leandro. Previously there were only two through lanes for I-238, but the Alameda County Transportation Sales Tax eventually funded widening of the freeway to three lanes per direction. Photo taken 02/20/12. California 238 separates from Mission Boulevard and follows Foothill Boulevard north from Downtown Hayward to Interstates 238 and 580. Photo taken 07/11/18. SR 238 transitions to Interstate 238 south to San Leandro and I-880 as motorists depart for I-580 east to San Ramon Valley and ultimately the Central Valley and Interstate 5. Photo taken 07/11/18. 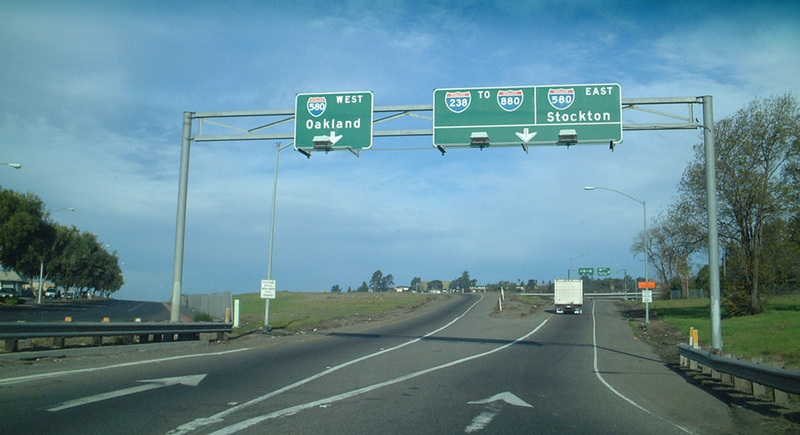 SR 238 splits into ramps for I-580 west, using the Mission Freeway northbound roadway, I-580 east and I-238 south. Photo taken 07/11/18. Advancing south from the 163rd Avenue on-ramp, Interstate 580 (MacArthur Freeway) next meets Exit 34 for both Interstate 238 north and SR 238 north. Photo taken 07/02/06. 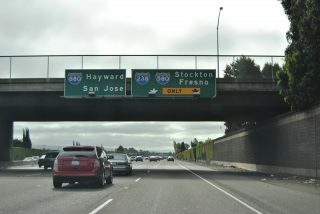 A two-lane off-ramp (Exit 34) departs Interstate 580 south for California 238 south to Hayward and I-238 north to San Leandro. I-580 turns east and overtakes the ending I-238 through Castro Valley. Photo taken 07/02/06. 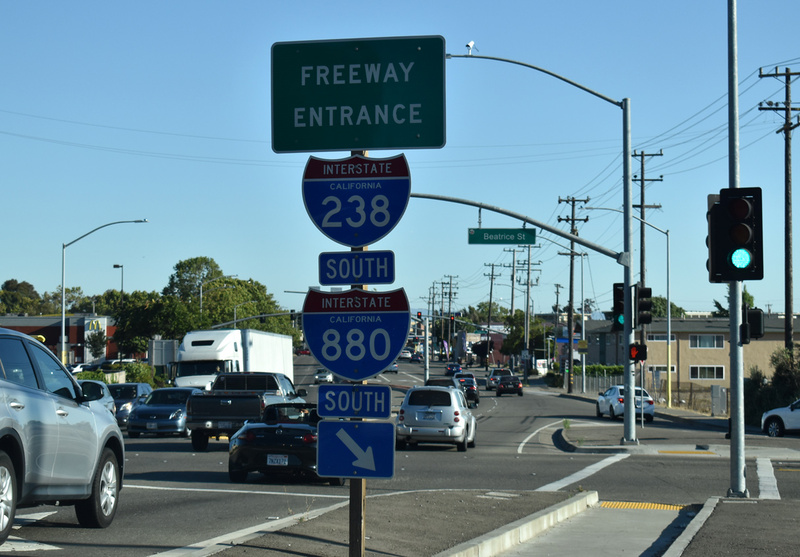 Exit 34 carries two lanes south directly to California 238 and Foothill Boulevard. 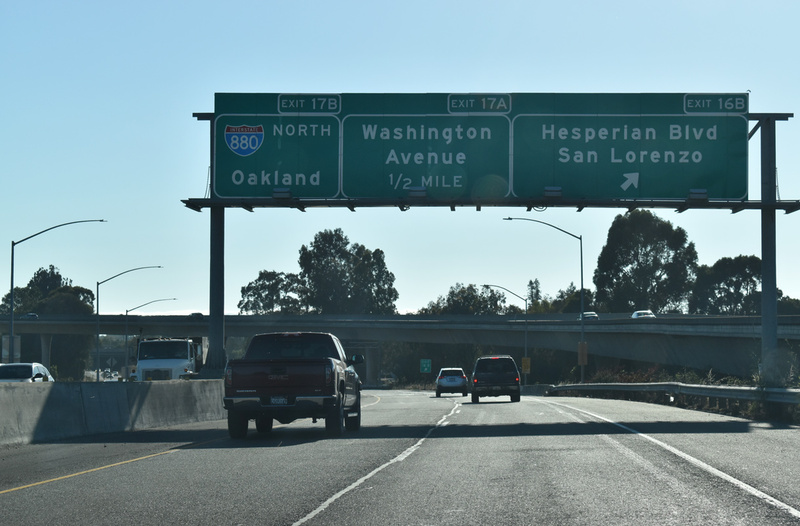 This would have been the Mission Freeway mainline had it been constructed south to Hayward. 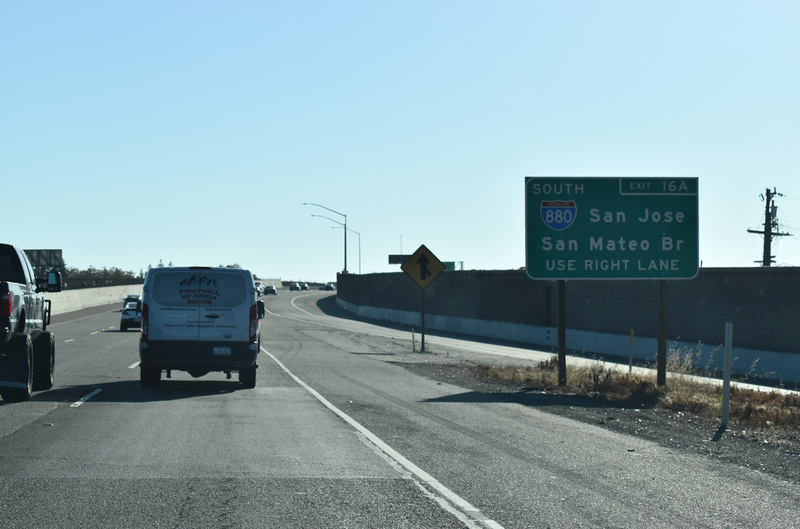 A single lane ramp otherwise turns west onto Interstate 238 to I-880 for motorists headed south to San Mateo Bridge (SR 92) or San Jose. Photo taken 07/02/06. 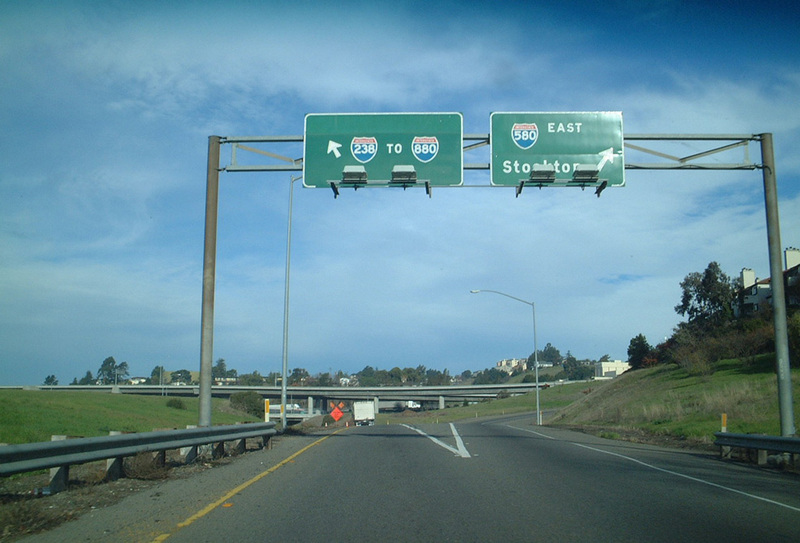 I-238 north at I-580 and SR 238 (Foothill Boulevard) north at I-238 and I-580 from 12/27/01. 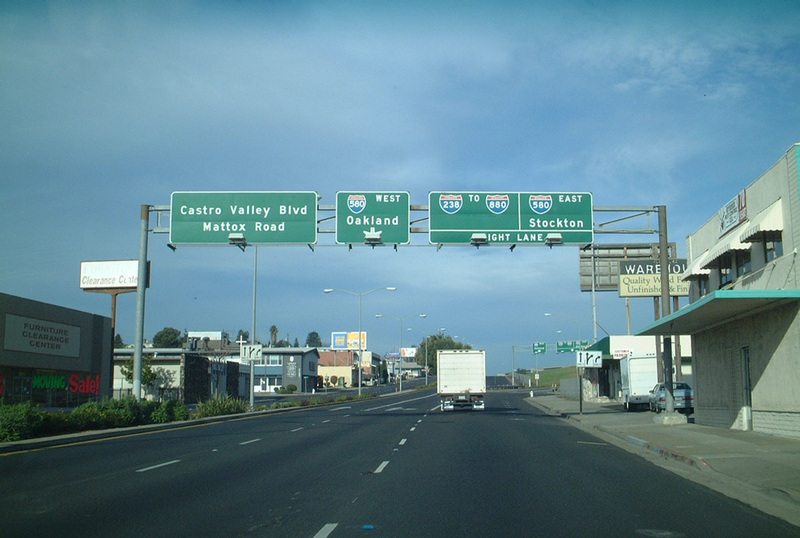 I-580 west at I-238 from November 2004.